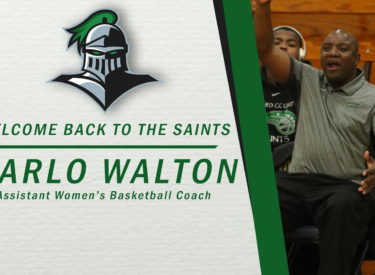 LIBERAL, Kan. – Seward County Director of Athletics Roy Allen announced Tuesday the addition of Carlo Walton to the Lady Saints basketball coaching staff as Assistant Coach. Walton, a 2016 Seward County Hall of Fame inductee, spent the past season as a volunteer coach for the Lady Saints, during which they went 32-3 with a fourth place finish at the NJCAA National Tournament. Over his two-year career with the Saints in the mid-90’s, Walton finished third all-time in scoring (1,422 points), and is still the all-time leader in three-pointers made (159), assists (436) and steals (224).